Not long ago, I remember telling our custodian some knock-knock jokes. She laughed... and that made me feel good -- although she may have been laughing more at my sillines than the actual humor of the jokes. But we both had fun with it that day; we both enjoyed the interactions. I remember a day earlier this semester when a student stopped me as I was walking around, and said, "Hey Dr. Steele... do you have time for a magic trick?" What principal has time for magic tricks? But I stopped... and was thoroughly impressed with his slight of hand. Every morning, I am in our cafeteria, helping to supervise students eating breakfast. We have an amazing CNP staff, and one of their special talents is making cinnamon rolls. I'm glad to see the lunch ladies every morning, and they seem glad to see me. Several years ago, I made a point to talk to them about how good their cinnamon rolls were. I didn't think much of the conversation at the time, but I did want them to know that I appreciated them... and their baking talents. The next time they served cinnamon rolls, there was a treat packaged up for me in the window between the kitchen and the serving lines: my very own cinnamon roll, set aside in a container. 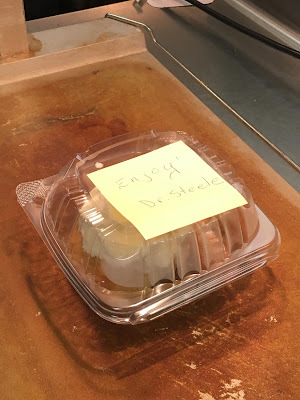 The sticky note read, "Enjoy... Dr. Steele!" For the last several years, on days when cinnamon rolls are being served, there is a special one waiting for me in the window. If I don't see it, they will call my attention to it. What a tasty tradition! So what do knock-knock jokes, magic tricks, and cinnamon jokes have to do with instructional leadership? What do they have to do with raising student achievment? But they have everything to do with culture. They have everything to do with relationships. They have everything to do with building the type of school where students enjoy learning and adults enjoy working. And this is the kind of school where kids and staff members thrive. School culture is not about the big things; it's about the little things. It's about the thoughtful gestures... and the high fives... and the conversations with students in the hallways... and all the smiles. Don't ever forget the smiles. And yes... sometimes, it's about knock-knock jokes, magic tricks, and cinnamon rolls. Thank you for sharing the post. I really admire you. Dr. Steele raps about the big test! Dr. Steele invents a dance to teach math! Dr. Steele dances and dreams with his students! Dr. Steele raps to his students about the power of choices during Red Ribbon Week! Dr. Steele raps to his students to motivate them for the ACT Aspire!